Terry Heyes; Janet Hickinbottom; Bron Putnam; Rona Taylor; Faith Ward; Mary Webb. Vaughan Owen representing the Parish Council. Apologies had been received from Andy Gibbs, Judi Hibberd and Diane Swindells. The minutes of the previous meeting of July 8th were approved. Residents’ views/concerns: It was believed potholes had been filled but this would be monitored again. Parish Plan: Claire, the Parish Clerk, was in the process of summarising information available regarding broadband speed with information about how to complete the necessary form. This would be circulated. Vaughan said he believed BT did not think faster broadband provision was a commercial viability and that residents should request fibre. Rona was to contact Alan about taking a lead on this issue. 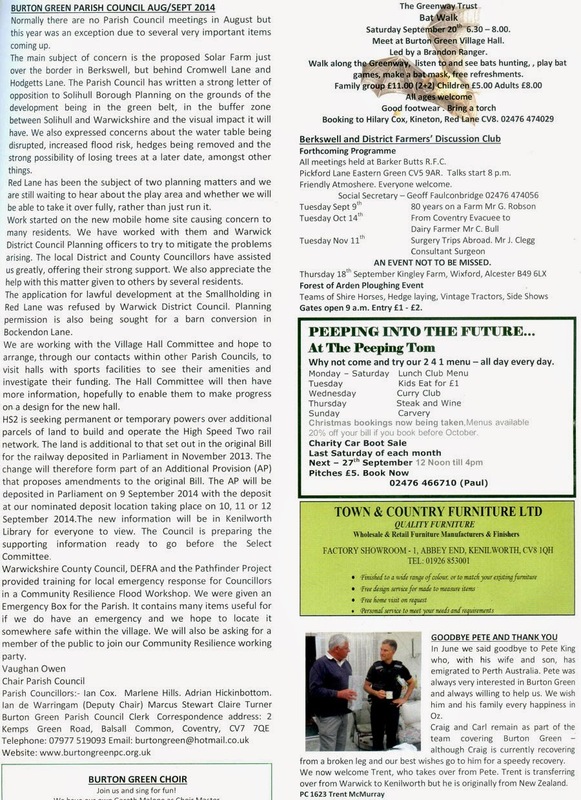 An item about water pressure had been added to the recent edition of the Bugle with information about residents contacting Severn Trent Direct if they had problems. Mobile library users had been given a survey. Chances of changing the service were unlikely as there were only two regular users. The Welcome pack was ongoing. Mary had sent some information but others were requested to do the same. Parish Councillor's report: Rona and Mary were to meet with Cllrs Owen and de Worringham on the following Thursday. Aircraft noise: Alice reported that she had been away for much of August but that the noise did not seem to have been so bad. It was agreed there had not been enough complaints to take it any further. The committee would continue to monitor the situation and let Vaughan know if there were any problems. Terry said there had no doubt been an increase in air traffic because of Birmingham airport runway extension and so this would appear more intrusive. Inevitably there would be more airspace conflict and aircraft may have to delay landing or turn more often. Vaughan asked about a second runway in the future. Terry said there might be simultaneous arrivals and departures but this would increase traffic significantly. The narrowness of the footpath along parts of Red Lane was a perennial problem, especially for parents and children walking to school. WDC had cut the grass but hedges were still overgrown and needed to be cut back. Faith would monitor the situation. A report was circulated (attached). Terry went through the report and said not much had changed over the last couple of months. Subscriptions had raised just over £700 but some were still to be collected, including all of Red Lane. The account was healthy because of the bonus of Summertime Jazz. Committee members were asked to be ready to decide at the next meeting. There was to be a meeting the following Thursday to look at a co-ordinated approach to petitioning in the village. Rona was to attend alongside Marcus, Archie and Cllr John Whitehouse and there would be co-ordination with Balsall Common. Rona had attended a Parish Council meeting at Berkswell where it had been decided that representatives from different organisations and activities within the village would take on different responsibilities. Rona was to see Jeremy Wright to ask his advice too. It was believed that petitioners in Burton Green would not be summoned until the end of the year at the earliest. A question had been asked that when the Select Committee and HS2 visited, would they look at Burton Green and Balsall Common together but this was refused. Solar farm: Thanks were given to Terry who had put in an excellent document on our behalf. Gratitude was also expressed to the Parish Council for their support. There was little new to add. The submission had gone in. An extension had been granted to the consultation period for a further 21 days as Green Energy had failed to add information about the need reroute a footpath. Rona wanted to know how many letters had been sent in. Rona had sent out an email to encourage people to object. The Residents' Association felt it had done all it could. 1st August Lunch: This was a success even though many people had been away on holiday. More help had been needed. There were problems with accessing the kitchen on Fridays because of a morning booking so a different day would have to be considered for the lunches. The next one was scheduled for October 31st with fish and chips. 12th September Young People's Forum: Around 15 to 20 toung people had attended. They liked the idea of having some provision. John Whitehouse had made reference to a double decker bus as a mobile youth club which it was planned to use on a future occasion in Burton Green. Those present had been interested in going to see Kenilworth Youth Club. The possibility of a quiz night was discussed. 28th September afternoon tea with World War 1 theme: Very few bookings had been taken so far. Helpers would be needed to prepare sandwiches in the morning and set out tables at lunchtime. Mary had faced difficulties with one of the suggested projects but was still pursuing this Rona had attended a talk at Finham Library about World War One and uncovered information about her grandfather which would be on show at the event. All matters were in hand. Rona wanted to make the AGM more interactive without long presentations. Rona's report was to be produced and available and she would make reference to it in a short introduction. Councillors had been asked to talk for three minutes only. People were to be encouraged to speak from the floor. Cheese and wine would be available as before. Rona was happy to organise this. Start time would be 7pm for wine and nibbles. All officers were happy to stand for re-election unless others wished to take up their positions. Bron, Alice and Faith agreed to stand down but to seek re-election. There was no report as no one had been able to attend. Details had gone round about the latest consultation. The question was raised: should BGRA do a separate response? Rona would speak to Andy and ask if the Action Group's response could be from BGRA too. 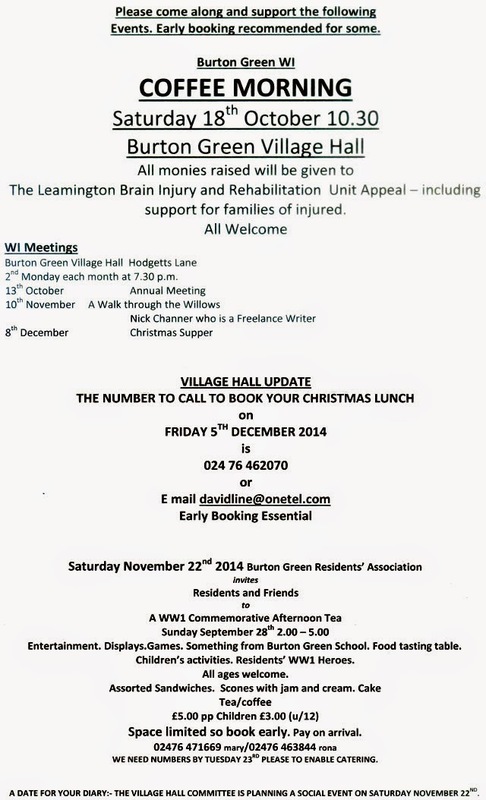 Rona circulated a proposed itinerary for a visit to Burton Green by members of the Select Committee on October 7th. Rona felt strongly that a small party, maybe herself and Marcus as they were both acting as Agent Bs, should try to speak with the visiting members to convey the importance of community cohesion and present a coherent view. Others said they thought larger numbers should be available. Rona was to speak to Jeremy Wright to seek his opinion of the best use of this opportunity. The issue would be raised at the AGM. An ecologist had made a presentation to the Parish Council about how ecology was considered when planning new developments. A community flood resilience plan was in place and Vaughan was in possession of equipment including wind up torches, a megaphone and hi visibility jackets. Alice said she was already a West Mids disaster plan representative. The speed limit changes were on hold at present because of cuts. This was queried and could be raised at the AGM. A new noticeboard was to be arranged in Cromwell Lane. The Le Van site had caused many problems. A hedge had been removed without proper permission. A pond was to be cleared out and restored. There were issues about sewerage, drainage etc. All were being closely watched as were proposed developments at Dixon's Barn on Westwood Heath Road which was in a green belt buffer zone. The Parish Council and the Village Hall committee were to consider the new village hall at Wolston and hear about how funds had been raised. 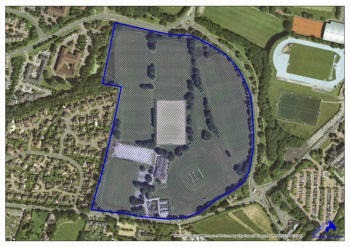 Recent proposals had been made for housing at the Coventry end of Cromwell Lane. Coventry Council had provisionally nominated the site for 230 homes. A resident had enquired about the ownership of the shelter in Red Lane which was used as a bus stop by children going to school in Kenilworth. He wished to find out who was responsible for its upkeep. It was believed that it had been used in wartime as a shelter for the air raid wardens. The same resident had an air raid shelter at the bottom of his garden which he was prepared to show to children at the school. Rona suggested an article in the next Bugle asking if other air raid shelters still existed. Workers in Cromwell Lane had damaged the gas main so it was likely the roadworks would take longer than expected. An email had been received from Warwick University explaining that the road from Gibbet Hill towards Burton Green was to re- open at the start of October and a month later open the other way. Many roads in Balsall Common would be closed for a fun run on 20th September. 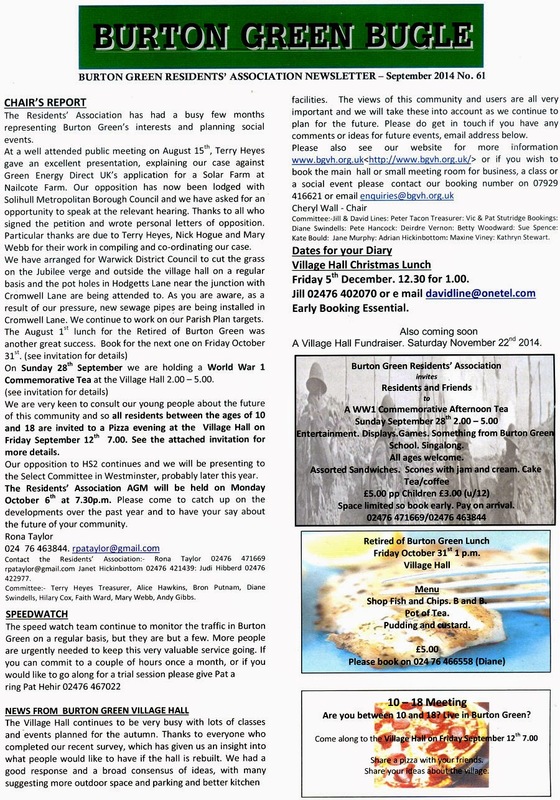 The next committee meeting would take place on November 18th at 7.30p.m.at the Village Hall. Mary gave her apologies for the AGM. More complete details are on the Coventry City Council website. 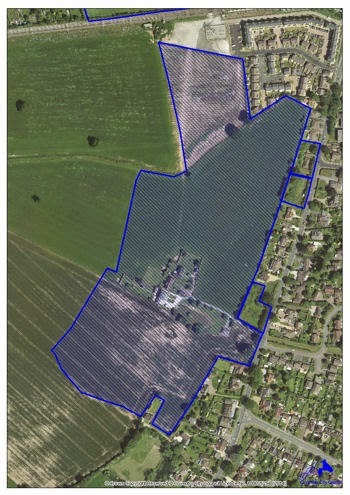 One of the proposed sites along Cromwell Lane includes all of the farmland surrounding Westwood Farm. This strategy is simply not sustainable. It is short-sighted. What happens when, as the plan suggests, every bit of green space within the City boundary has been built on? The next Parish Council meeting will be held on 15th September, at 7pm. Please note the earlier start time. 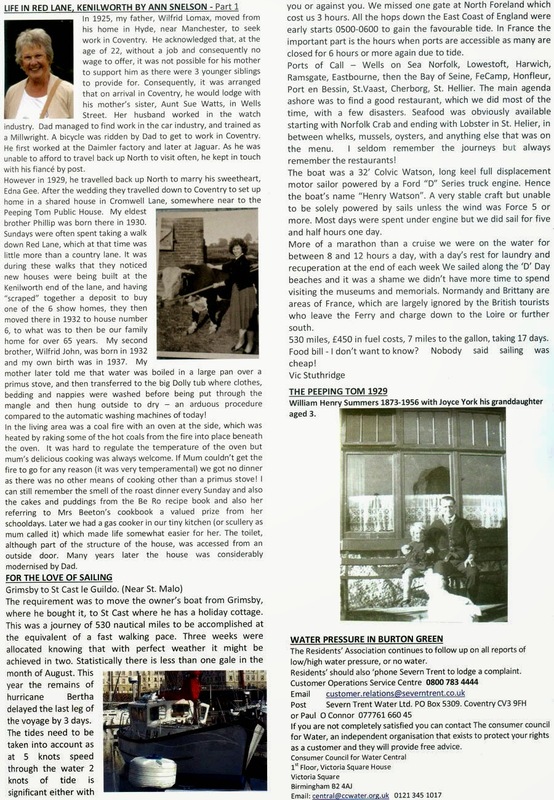 The September 2014 edition of the Bugle has been published. Prepare your fruit and vegetables and make your preserves etc. The hall will be cleared then for judging to commence. Followed by Auction of Produce and Raffle. Plus tea/coffee/soft drinks and Home made cakes will be served all afternoon.